This is another post from last year... so I apologize for the banner reading "2010" instead of 2011! But hopefully you get the idea! I think I'm going to do something similar tonight with my kiddos... Enjoy! Did you see us on Studio 5 today? One of the simple ideas that YOU can make at home for your New Years Party is a simple pennant banner. All you need is some colored cardstock, a few yards of 1" (or wider) ribbon, and some party horns or blowers! 2.Print out templates and cut out banners. 3.Lay your ribbon out on the floor and make a pattern using the flags and horns. Get everything situated how you want it. 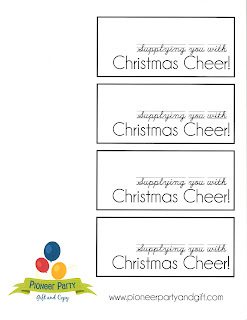 4.String blowers on ribbon, then staple your cardstock flags right onto the ribbon. This is a re-post from last year when we were on Studio 5 for New Years Ideas...Hope you can find something fun to do for your party! 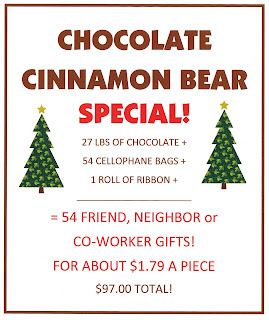 So you buy a 27 lb box of chocolate covered cinnamon bears, and you get 54 cellophane bags and a roll of ribbon. You can split it up into 54 1/2 lb. gifts, or 27 1 lb gifts...! Call & order yours today! In our copy center, we have a little center for kids to sit and color while mom or dad makes copies. 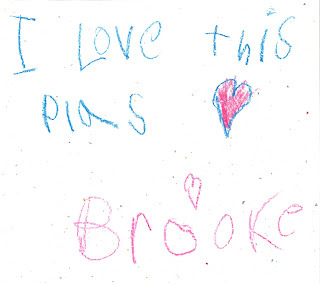 We have clothespins to hang up the pictures, and this is what I found today while I was straightening up. IT MADE OUR DAY HERE AT PIONEER PARTY! So thank you to Brooke for coloring this beautiful picture! American Express is doing a small business promotion throughout December... So here's the deal- you spend $25 at Pioneer Party, and receive a $25 credit on your card! What a deal! All you need to do is register your card beforehand, and then come SHOPPING! If you already use American Express you won't want to miss out on this - you'll be getting $25 in merchandise basically FREE! Merry Christmas! If you saw our segment on Studio 5, you will have a good idea of what the following tags can be used for! The next tag is perfect to attach to a cello bag with 2-3 jolly rancher sticks (sold on our website here) Print on red or lime green, add some festive polka dot ribbon - and you have a very inexpensive gift! Great for teachers or friends... You can buy them already made if you'd like! This tag is just right to tie to a mason jar full of the mini jolly ranchers! Hope this helps make your Teacher Gift Giving a little easier this year! If you missed the segment, watch the video to see how the gifts above look all finished, as well as about 6 other ideas! Enjoy!